Put fish pieces in a bowl. Add salt, pepper powder, lemon juice, garlic paste and ginger paste, mix and set aside to marinate for 10-15 minutes. Grind together bread slices, coriander sprigs, parsley sprigs, basil leaves, salt and chilli flakes to a coarse mixture. Spread the mixture on a plate. Line a baking tray with aluminium foil and grease with some butter. 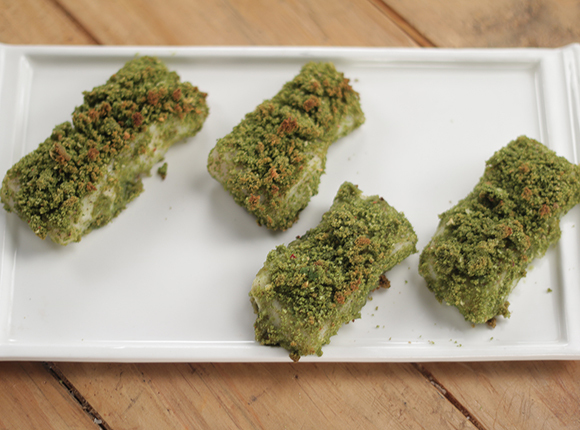 Coat the marinated fish pieces in the prepared herb mixture and place on the lined tray.